Our Mission is the Work which we Elevate to an Art. Over the past 16 years, most of our clients have had musculoskeletal system and spinal problems (backache, pain in the spine, head, shoulders, hips or knees). So our main specialization has therefore developed from these oft-repeated needs of our clients. Of course, we also treat other health problems, and seek their causes. Prevention and the suggestion of a remedy for the problem a client is suffering from, are an integral part of our work. Our many years of experience are our mainstay. Our company is registered in London, but we work throughout Europe and anywhere that our assistance is required. Many people cannot leave home for various reasons (health condition, travel cost, pets, etc.). For that reason, we go to people anywhere in the world. So you will always find us where we have been invited or where someone really needs us. Maybe in your own home? That is why we do not include any specific location or address on our website. Preferably by e-mail or via our Contact form. Because we spend a lot of time with clients, in traveling or teaching, this is the best way of contacting us. Unless we are temporarily without access to the Internet, we reply to e-mails within 24 hours. Of course, you can also send us a private message on Facebook. You will find the e-mail address, link to our FB page and Contact form in the footer of this site. Are there any health problems or circumstances when it would not be possible to apply your therapies? Is it worthwhile for you to travel the world to help people? Our treatments, during which we use energies and body candles, are not painful. If acupressure and other techniques, during which inner spasms must be released, are used, such therapy can be uncomfortable for sensitive individuals. We always work individually with each client and adjust the therapy to his or her state of health and needs. The client is always warned in advance about possible pain and can decide whether or not to accept such a treatment. Unfortunately, the activation of organic and other pathways which accelerate healing of the organism is sometimes unavoidable. We see our work primarily as a mission. We enjoy helping and encountering new people, cultures and places. In future, we would like to summarize our experience in the form of a book and documentary film. Of course. We do not work with women in an advanced stage of pregnancy, with clients with serious mental problems, fresh injuries, falls, fractures, etc., but this is again highly individual. For this reason, it is important to contact us before the therapy itself to describe your problem in detail. Usually it is always possible to assist and to choose a gentle form of therapy, e.g. harmonization therapy or similar, for better regeneration of the organism. In no case should a client undergoing therapy be on pain-relief medication or be undergoing other therapeutic or rehabilitating séances elsewhere at the same time. How much does your therapy cost? How many treatments must be undertaken before my condition improves? Can one sometimes feel bad after your therapy? Payment for our therapeutic assistance is highly individual, depending on where we travel, whom we help, how many treatments are performed, what costs are connected with our travel to meet clients. The price of treatment differs in Europe, Dubai, the USA, New Zealand and Bali. Everything can be arranged via e-mail and you will always be given a price quotation in advance. Yes. One person may feel a surge of energy, another may feel tired, yet another may feel pain in certain parts of the body for 3-4 days, etc. Once more, the reaction is very individual and it is again true that reactions are directly proportional to the health status of the client. This is highly individual and dependent on the client’s health condition. The same applies to the reaction after therapy and rehabilitation. We can never promise in advance the exact number of treatments. We share with the client the desire to solve the problem in cooperation with him/her as quickly as possible. The number of treatments depends on the problem and overall health status of the client. The same problem of two clients can be resolved in different ways and over different lengths of time. However, we strive for the minimum number of treatments. One or two treatments are very often sufficient. What languages do you communicate in? What are your recommendations for what a client should or must not do after your therapy? We can say that, in recent years, our clients are of different ages, originating from the whole world, but mostly from Europe. We speak several languages, but as a lingua franca we choose English, although it is not our mother tongue. A client must rest for 3-4 days – no hard work, no exercise, not be exposed to draughts or cold. Plenty of water should be drunk, ideally with lemon slices, and stress must be avoided. How long have you been devoting yourself to therapy? How many treatments can you perform in 1 day? 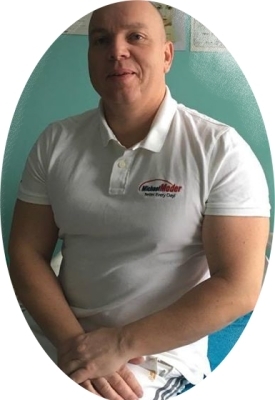 Michael Moder, creator of the “Moder Pain Relief Method”, has over 30 years of experience and has performed more than 20 000 treatments. We collaborate with physicians and are continually learning. Our therapy is very energy-demanding, that is why we perform at most only 5 treatments per day. One treatment usually takes 45 minutes, but it may happen that this is prolonged if a specific situation requires it. Can you outline a model example of how we could invite you, for example, to Ireland, to perform several treatments on more people? Do you have any specific conditions for visiting us? Do you contribute to any charitable causes? Only the most important one: That everything we agree on is fulfilled and both sides are satisfied. Yes, of course. We contribute either monetarily or by gifts to specific persons or institutions, or by assistance in performing free therapy, lectures, etc. However, we alone choose and decide in what form and to whom we offer assistance. 1. Appoint an organizer to invite people interested in therapy for specific dates. 2. Obtain an appropriate room with a massage bed, where therapy can be performed in a quiet atmosphere. 3. Count on us being able to perform 3 treatments in the morning and 2 in the afternoon: a total of 5 treatments per day. 4. Based on the number of people, we determine the length of our required stay in Ireland. 5. We will need accommodation arranged near the venue of our treatment sessions. 6. We will agree on the exact date of our visit to your venue (from – to – ). 7. According to this information, travel costs and accommodation are calculated. Subsequently, the total price, or price per therapy session, and the optimum number of days for our stay, are calculated. 8. Other specifics are arranged by email before our arrival.